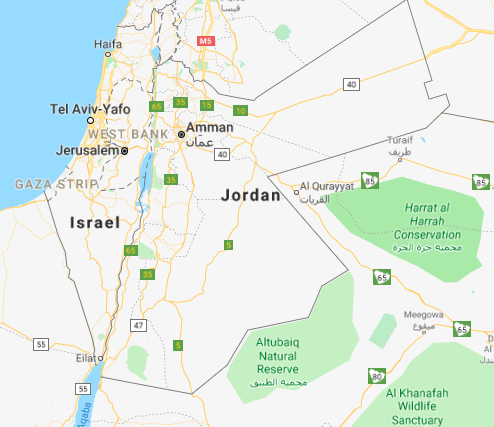 “Jordan.” Map. Google Maps. Google, 31 Oct. 2018. Web. 31 Oct. 2018.
of the seven wonders of the world. This not only exemplifies the exquisite cultural history that existed in Jordan, but it also designates that Jordan is a nation that preserves historic and cultural identity. Latifa is a second generation Arab American woman who has recently graduated from the University of Wisconsin- Milwaukee. She is originally from Jordan and currently lives in the Milwaukee Area. Latifa has about ten cultural dresses including a few thobs and dishdashas which she usually wears to social events such as weddings or religious outings to the mosque. She feels very “extravagant” when wearing the dresses because because they are beautifully embroidered and beaded.The dresses give her meaning and a sense of pride and self-recognition because she says that each dress is symbolic of where her parents and her family come from. Her mother wears cultural clothing as well and passes down some dresses to Latifa and her sister. Latifa notices the difference between the cultural dresses she buys for herself compared to her mother’s because they are “a lot more beaded” and she continues to buy them from Arabic stores and overseas. As her mother passes down dresses to her, Latifa would like to do the same when she has her own children.